Governor Andrew Cuomo declared victory and then promptly got out of town. The state’s spring legislative session from hell had just come to a perversely perfect ending — it hadn’t really ended. Legislators still needed to be briefed on key details, bills needed to be printed and passed, and the resolution of one giant issue —state subsidies for real-estate developers — had been outsourced for six months. But yesterday afternoon in Albany the governor and the leaders of the State Assembly and Senate staged a press conference to announce tentative deals. About an hour later, the governor was on the road to his youngest daughter’s high-school graduation, dialing reporters and selling a flattering version of events from the passenger seat. Finding good news in all this was considerably tougher for Mayor Bill de Blasio. 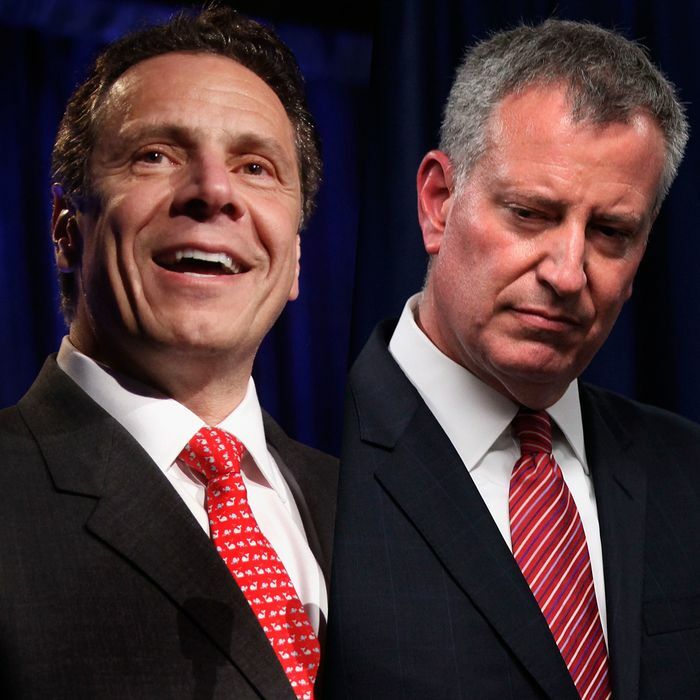 It’s been clear for weeks now that de Blasio was going to get significantly less than he wanted out of Albany this spring on his three big policy goals, yet the mayor came away nearly empty-handed. An increase in the rent threshold at which apartments become market-rate, indexed to rise each year, is a step forward, but it only slows the bleeding — and is well short of de Blasio’s target, ending vacancy decontrol completely. The six-month extension of 421-a, the tax abatement program that’s supposed to produce cheaper apartments, delays de Blasio’s push to build 160,000 new units of affordable housing — and it could turn out to be a large setback, if the final bargain substantially raises construction costs by incorporating a large “prevailing wage” component. And after asking for permanent mayoral control of the public schools, then retreating to a three-year continuation, de Blasio is being made to swallow a puny one-year extension — plus 25 more charter schools. Could the mayor have played the game better? Cuomo’s camp says de Blasio underestimated the anger of Senate Republicans at the mayor’s failed attempt, in 2014, to topple their majority, and that he misunderstood Albany’s dynamics on 421-a by crafting a plan with the real-estate industry and “inflaming” labor unions. De Blasio’s allies accuse the governor of being disingenuous, that it was Cuomo who wielded the bellows with construction unions and Republicans — and that the governor had the power all along to craft more city-friendly bargains if he’d been interested. Cuomo’s main motivation on a 421-a deal, though, seems to be staying as far away from direct involvement as possible, for fear of attracting more attention from U.S. Attorney Preet Bharara. That’s why the governor is leaving it to the unions and the developers to strike a deal on their own between now and December. The mayor largely lost this round on policy substance, but his lieutenants believe de Blasio will get credit — especially with city voters — for having done the responsible thing by presenting fleshed-out proposals and assembling broad coalitions to lobby in their favor. That’s one reason why City Hall began, early and often, to place responsibility and blame on a dysfunctional state capital. Now, with the dimensions of his practical defeat in place, the mayor’s aides think he’s won the political narrative. Maybe, but that sure looks like wishful thinking at the moment. And it’s very difficult for tenants to rent a narrative. What could be even more trouble is that de Blasio’s “friend” the governor, after a rocky few months in Albany, sounds as if he’s enjoying the fray again.